The riding school at Red Acre Farm offers riders, of all ages and abilities, exceptional instruction on safe and reliable horses. 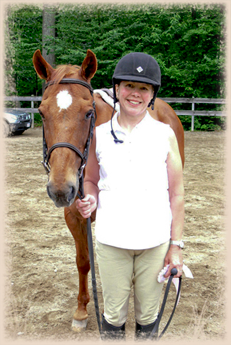 With an emphasis on safety and horsemanship, Kathy and Mitch Steege work with students to meet their individual goals. Small group lessons are offered and dependable school horses are available for riders of all levels. Schooling shows are held during the spring, summer and fall for riders in the lesson program. Students who are interested in more than a recreational program, or who are interested in showing at the local, regional, IEA or national level may choose to get involved with our competitive riding program. Twelve safe, friendly and well schooled horses. Group lessons are limited to four people. Recreational riding program is offered to beginning to advanced level riders. Practice horse shows are offered in the sping, summer and fall. Clinics are offered to gain exposure to a variety of teaching styles.